It's no secret we like to keep it simple around here. Every now and then I get a wild hair and do some sort of more involved baking like the apple turnovers, but most times I like to stick with quick and easy treats. Last week I had to make something for the bake sale for our school's fall festival and because I was in a time crunch I made the candy corn snack mix that my family loves. I packaged it up in little bags and tied with ribbon and was done. The whole thing took less than 10 minutes. And you know what was all gone at the bake sale on Saturday? My treats! You know what was left??? The more involved and elaborate things. Kids see marshmallows and candy corn and that is what they want. When I told Boo-Boo that we had to go get the ingredients for that snack mix I was trying to explain to him what it was. He kept asking if it was the pretzels with M&M's on them because he couldn't get it out of his mind. That got me thinking about a Halloween version of this simple treat so I promised him we could make those, too! I've done several variations of this treat including Pretzel Rolo Pecan Poppers, Green Eggs and Ham Pretzel Bites and Christmas Pretzel Bites . 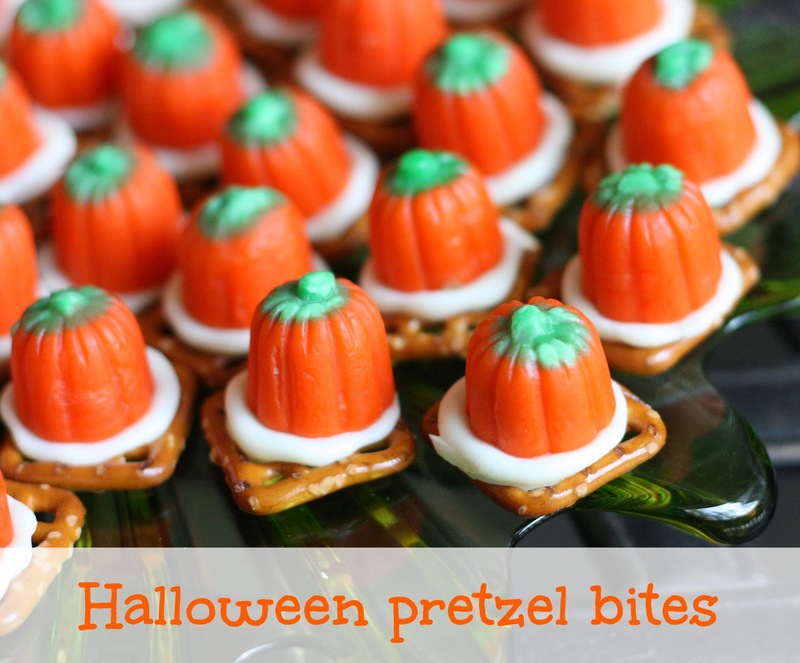 For this one though we used the candy corn! To avoid a trip to the craft store to get candy melts I was happy to find that Ghirardelli now has white chocolate melts in the grocery store. 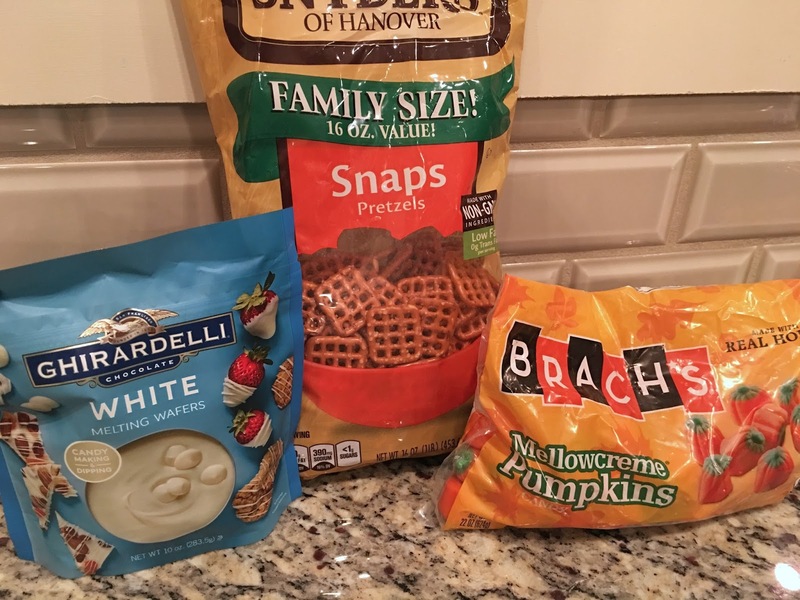 Because my kids love the pumpkin candy corn we used those until we ran out and then switched to regular candy corns. 1. Line cookie sheet with pretzels. 2. 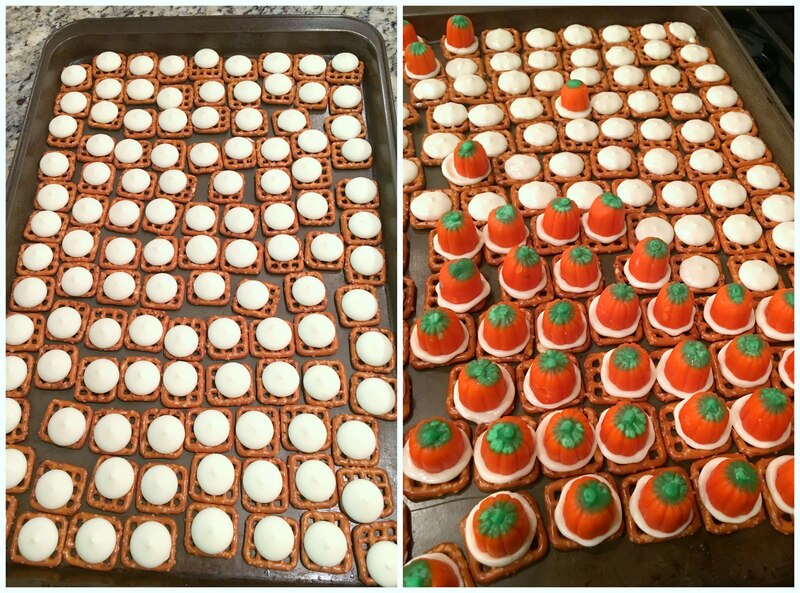 Place chocolate melt on each pretzel. 3. Bake at 325 degrees for 3-4 minutes or until chocolate starts to melt. 4. 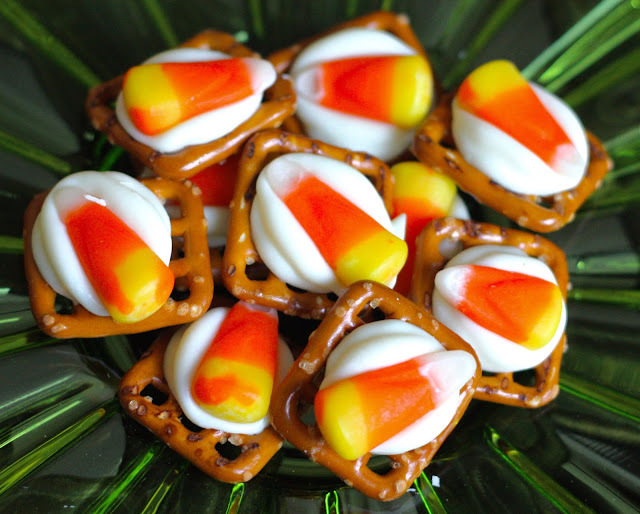 Remove from oven and press a candy corn onto each pretzel. 5. Cool in refrigerator to help harden.